I always dreamed about a fancy race day. Dressing up, looking all pretty, sunny day with friends & glass of wine, while watching a race. Its something posh & grown up about it, isn’t it? Well let’s do it right. Let’s check what to wear to the Races this summer, shall we? There’s nothing like a day at the races for a chance to dress up & really let your sense of style shine. When it comes to racing fashion, it’s an event where you can really go all out & make sure that you’re looking your absolute best. Whist there aren’t really any set rules for racing day dress code, the vast majority of racecourse spectators stick to a pretty smart dress code that’s often verging on black tie. If you have an upcoming race day planned & want to look your absolute best, read on for the best tips in the book for both girls & guys. If you’re a guy planning a day at the races, it’s good to know that ties & jackets are not compulsory – so there’s no need to go all out if it’s a really hot day. But, that doesn’t mean that you can’t still look amazingly suave – smart casual, such as tailored dress trousers & a crisp white shirt is a good look for the most race days. Have a look at formaltailor.com for a range of tailored suits, trousers, shirts & accessories that you can wear to the races to look your best. Dressing up for the races is often the highlight of the whole event for plenty of ladies – especially when it’s Ladies’ Day! When choosing your outfit, remember to make sure that it’s appropriate for the weather – checking the weather forecast beforehand & taking a shrug or jacket to put on if the temperature drops is a good idea, as the last thing that you want is to find your day ruined by the cold or rain. Classy & elegant is the way to go for race day attire, & playing it up with accessories such as fascinators & hats is definitely a must. When it comes to footwear, don’t opt for heels that are too high as you don’t want to struggle to walk! For a day at the races, both guys & girls definitely want to stand out – and for all the right reasons. One of the best ways to make sure that you stand out is to choose your colours carefully – picking outfits that use bold, rich colours or vibrant patterns can not only make sure that you’re looking great, but also means that you’ll stand out in the crowd & get noticed. For girls, this could mean choosing a dress with a bold, modern print, & for guys this could be getting an unusually coloured suit or a stand-out tie. For the ladies, picking a hat or fascinator which is a little unusual is a great way to make sure that you don’t blend in! 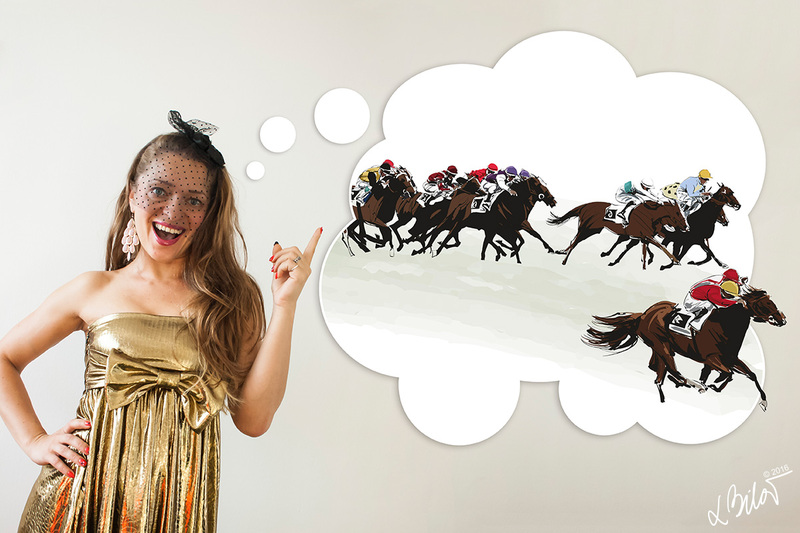 Whatever you wear, a day at the races is all about having fun & making sure that you have an awesome experience. I’m sure that no matter what you choose to wear, you’ll spend your day looking & feeling absolutely fabulous when you follow these tips (Let’s hope English weather is on our side too)! Previous PostShop. Save. Smile. Repeat.